It's not. If Serie A gets ~4 more points that Premier League in current season, Italy will have 4 teams in CL in 2016/17. It is not gonna happen tho. I read something from Gab Marcotti who said it would be 2017/18. It makes sense really, because you can't have all these sides being under the impression that they can make nth place and make it / not make it and it changes all of a sudden. Simply, the spots that are awarded this season should stay as they are. umm no. If Serie A surpasses EPL this season, there would be one season(16/17) needed to decide which teams get the 4 CL spots. Serie A would have 4 teams in 17/18 CL if they qualify. Think for a minute. The amount of CL spots are decided before and not after the season. * - c'mon, it aint happening this season. Please just delete this gobbi wanker. Shitposter always spreading his ignorance about Europe. No. 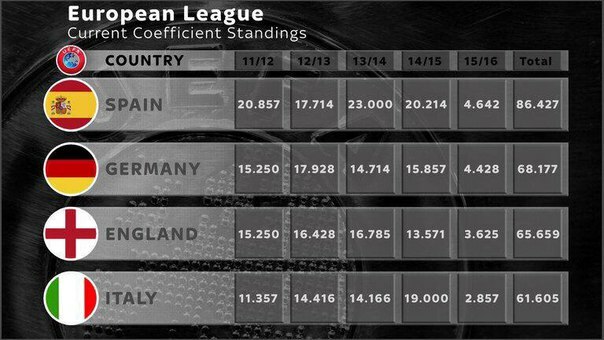 4 teams will be able to qualify in 16/17 to compete in the17/18 season. This season it's 3 teams that can qualify and 3 teams will play next season. the associations' coefficients from seasons 2009/10 to 2013/14 inclusive. of their coefficients from seasons 2010/11 to 2014/15 inclusive. I'm sorry, that's what I actually meant to say but didn't re-read my post and correct it. I didn't get Jaspers post at first glance, my bad dude. Hitman should be banned for spreading nonsense. roma doing their best to make sure that serie a never get back their 4th CL spot ! Arsenal doing their best for the opposite.